Markets were subdued as investors held fire before the Federal Reserve’s expected interest-rate hike later Wednesday. 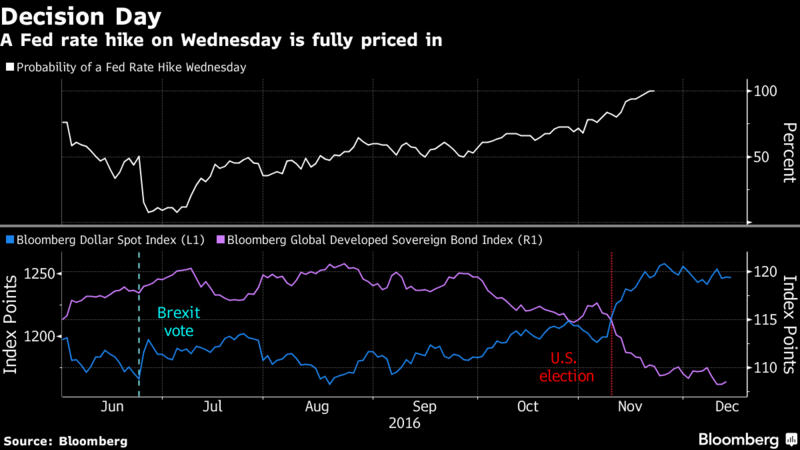 Crude and Japanese government bonds were outliers, with oil retreating on industry data showing U.S. stockpiles rose and debt rallying as the central bank stepped up purchases. A gauge of Asian equities added 0.1 percent, while Japan’s Topix index halted a six-day advance. European equity index futures declined. A gauge of the greenback’s strength edged lower as the euro strengthened. The yield on Japanese 30-year bonds slid eight basis points. Oil declined 0.9 percent in New York. The Fed’s path to tighter monetary policy has been delayed throughout 2016, as first instability in Chinese markets, then the shock votes for Brexit and Donald Trump, put policy makers on the back foot. The U.S. central bank is expected to boost borrowing costs just as the focus shifts back to governments, with fiscal easing at the hands of incoming U.S. President Trump speculated to drive economic growth going forward. After Wednesday, traders see a two-in-three chance of additional rate increases from the Fed by June, futures show. China’s broadest measure of new lending rose to 1.74 trillion yuan ($252 billion) in November, compared with a median estimate of 1.1 trillion yuan in a Bloomberg survey. Japan’s Tankan gauge of sentiment among large manufacturers came in as economists expected for the fourth quarter, rising to 10 from six in the previous period. India reported a 3.15 percent increase in wholesale prices for November. Almost two stocks fell for each that rose on the MSCI Asia Pacific Index as of 7:12 a.m. London time, with telecom shares rising most and material producers falling. Euro Stoxx 50 futures contracts declined 0.3 percent. Australia’s S&P/ASX 200 Index climbed 0.7 percent; Tatts Group Ltd. surged 8.5 percent after a consortium including Macquarie Group Ltd. and KKR & Co. offered as much as A$7.3 billion ($5.5 billion) for the company. Hong Kong’s Hang Seng Index gained 0.2 percent. Topix dropped 0.1 percent; Shanghai Composite Index fell 0.5 percent and South Korea’s Kospi closed flat. U.S. index futures were little changed after the S&P 500 rose 0.7 percent to an all-time high and the Dow Average neared 20,000 points. The yen was little changed at 115.17 per dollar after pulling back by 0.2 percent last session. The euro strengthened 0.3 percent at $1.0650. The Bloomberg Dollar Spot Index, a gauge of the greenback against 10 major peers, dropped 0.1 percent after rising 0.1 percent on Tuesday and sinking 0.6 percent in the session before that. Traders say the dollar should have a muted reaction to the Fed’s expected 25 basis-point hike, but may see more volatile price action in reaction to Chair Janet Yellen’s subsequent press conference. Japan’s 30-year government bond yield fell to 0.73 percent. Yields on 10-year Australian notes fell three basis points to 2.79 percent, while similar maturity New Zealand bonds yielded 3.30 percent, down one basis point from Tuesday. Treasuries due in a decade yielded 2.46 percent, down two basis points. West Texas Intermediate crude retreated to $52.45 a barrel, following a four-day surge of more than 6 percent. U.S. inventories increased by 4.68 million barrels last week, the industry-funded American Petroleum Institute was said to report. Government data Wednesday is forecast to show supplies fell. Oil markets will swing into deficit in the first half of 2017 as producers curb supply, according to the International Energy Agency, earlier than its previous forecast. Copper futures rose 0.4 percent, gaining for the first time in three days. Gold added 0.3 percent to $1,161.66 an ounce in the spot market.